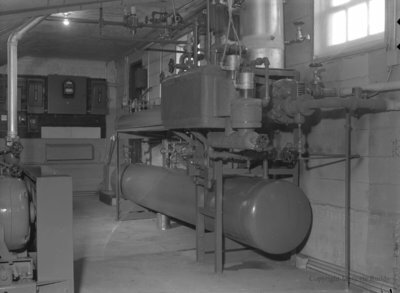 A black and white large format negative of machinery inside the Whitby Community Arena. The Whitby Community Arena was built between 1953 and 1954 on the site of the Burns and Taylor arena. It was located on the block bound by Brock, Ontario, Green, and Gilbert Streets. The Community Arena was official opened on 29 September 1954. It operated until 1972, when it was condemned under provincial building standards and demolished. Inside Whitby Community Arena, February 26, 1955, Marjorie Ruddy. Whitby Archives A2013_040_282.